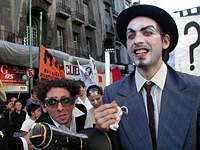 Argentina’s troubled history, culminating in the major crisis of 2001, has seen the rise of a wave of original artistic and cultural expression. The documentary The Art of Resistance introduces us to several creators and artist collectives who use artistic expression as a means to deliver powerful social statements, explore unbridled creativity, and participate actively in constructing a new reality. The Art of Resistance is an inventive treatment of these artists’ responses to the critical situations they are living. Born in a climate of urgency, their creativity is without boundaries, their strategies constantly renewed. The 85-year-old visual artist León Ferrari launches a vigorous national debate by denouncing the Catholic Church’s dark underside, factories open their doors to artists who conceive performances among the workers, patients at a psychiatric asylum join together to form an artistic front and charismatic actor Julio Arrieta makes a movie about the extraterrestrial invasion of his shantytown. The Art of Resistance is a penetrating portrait of the artistic and political methods of cultural resistance in Argentina. The film follows these inspiring and revolutionary characters as they struggle to meet the challenges of economic and cultural disintegration and critically examine proposed solutions to the problems of the day. It illustrates humanity’s profound capacity for creativity and resilience in the face of adversity. The spectator is invited to witness inspiring examples of this potential as they unfurl against the backdrop of Argentina’s ongoing crisis. Pre-selected at Cannes’ Semaine de la critique 2006. Opening film at The Guelph International Film Festival 2006. Presented at FIPATEL 2007, Biarritz; 3 Americas Film Festival 2007, Québec; Flying Broom International Women’s Film Festival 2007, Turkey; Human Right International Film Festival 2007, Buenos Aires; Festival des Libertés 2007, Bruxelles, National Film Board of Canada Cinéma 2008; Working Class Film Festival 2008, Turkey; Documenta Film Festival, Ecuador.